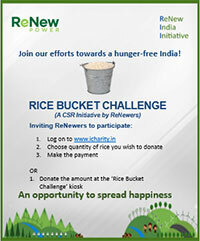 We are happy to inform you that ReNew Power is organizing the Rice Bucket Challenge as part of its CSR initiative under RII (ReNew India Initiative). This initiative aims at collecting funds for the purchase of rice to be distributed to the underprivileged people in ReNew Power’s partner NGOs. Donate towards the purchase of rice for the charity bucket from 3rd October till 13th November 2018. Do take up the challenge to put a smile on someone’s face and some rice on their plates. ReNew Power will match your contribution for this cause! Come forward and participate! Donors can donate Rs 500 (for 10 kgs of rice) in single or multiple units (2,3,4 etc). Each unit will cost Rs 500. *Note: ReNew Power will purchase rice equivalent to the donation amount and distribute it to the children in need through its partner NGOs.